To Be Successful -- For *FREE*!" Sorry, You're Too Late-- Our Free CD Offer Is No Longer Available. However, You Can Still Get The Digital Version For Free! Read Below. 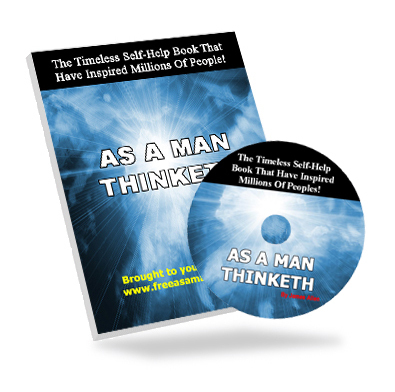 If you have not heard of "As A Man Thinketh", then you're missing out a powerful course that can literally change your thought process to achieve success in life. In fact, even the world's #1 success coach, Anthony Robbins had mentioned As A Man Thinketh in one of his audio courses. Instead of reading the book, I'm going to give to you a FREE As A Man Thinketh MP3 Audio Course CD with absolutely no string attached. This is the real famous classic of the "As A Man Thinketh" material. It's the complete course and you're getting this with no-string attached. So if you're wondering why in the world I'm doing this ... there are many reasons to it. First, I think this course will definitely help you become more successful in life and I simply wants to share it with you. Secondly, the more value you're getting from me, the more you'll appreciate the products that I've created and be creating. Thus, it'll be easier to get you to become my future customer (At least I'm being honest!). It's business sense. But for now ... I got nothing to sell to you in the audio course. It's all packed with pure, rich content in this CD. This fantastic audio contain subliminal affirmations which have been recorded both forwards and backwards to make the subconscious mind more susceptible to it. It also contains quality binaural beats which are the most recognized form of brain training technology used world wide. The sound will stimulates between the right and left hemispheres of your brain to create the desired result -- Being able to increase your motivation unconsciously. Like all our binaural beat recordings, simply slip on your stereo headphones and listen to it. The binaural beats will automatically begin affecting your brainwaves, and you'll soon realize the benefit - without "working". You won’t consciously hear the subliminal messages but your unconscious mind will hear it loud and clear for your life improvement. YES Patric! Please rush me the FREE CD of the world's famous, "As A Man Thinketh" MP3 Audio Course. I understand that I can get this CD absolutely FREE with no strings attached while the offer is still available! Click Here To Request For Your Free CD Now! Sign Up Success Trace Private Membership's trial month for only $4.95 (less than the amount you need to pay for shipping & handling, if we're still running the free CD offer). Once you've signed up, email to helpdesk@patricchan.name with your invoice ID by putting the email Subject: Free As A Man Thinketh Digital Version. Once we receive your email, we'll be able to send you the download link within 48 hours. Copyright by Patric Chan All Rights Reserved.